This information is updated daily (when possible) and the figures reflect the previous 24 hours. 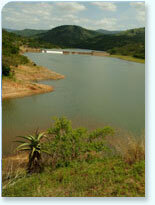 Hazelmere Dam has been raised to increase its capacity and therefore a new area capacity table has been implemented to take into account the new dam capacity. This has changed the dam level percentage as it now takes into consideration the new supply level.